Seeking out the various health and lifestyle niches of various carriers is what differentiates us from our competition. We help our customers through placing each specific customer with one of the top rated best life insurance companies or top no physical exam companies available, based on a specific customer’s health or lifestyle. This allows us to help our clients find the best life insurance rates. To find out what bronchiectasis friendly life insurance company you should consider please give us a call today! Do you have bronchiectasis but still want to get life insurance coverage? Don’t worry; your medical condition doesn’t have to hold you back from a good life insurance policy. Despite having bronchiectasis, you can still qualify for a policy with the help of TermLife2Go. We’ll guide you through the process and give you all the information you need to know about applying for life insurance with bronchiectasis. What is Bronchiectasis and why do life insurance companies care? Your entire body uses the air you breathe. Air travels in and out of your lungs through tubes or airways called bronchi. When you have an infection, these airways sometimes get clogged up with mucus, making it harder for the air to travel through your body. As a result of infection, your lungs may get scarred or continue to have a hard time to remove the mucus, even after the infection is gone. This is because your airways have been widened. This can happen in one or more bronchi and is known as bronchiectasis. Bronchiectasis also increases your risk of future infections, making this a cyclical problem. 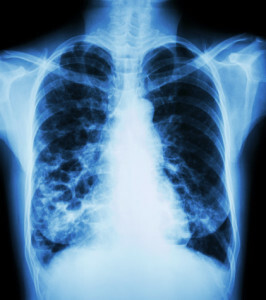 Each time you get an infection, your lungs and bronchi may be further damaged. Life insurance companies will be concerned with bronchiectasis because it leads to permanent damage of a vital organ. Any time you have injured or permanently damaged a vital organ, life insurance companies may consider upping your premium, or even potentially denying you a policy. Life insurance companies will not only be interested in the fact that you have bronchiectasis, but also the cause of it. The cause may signal other health problems. For example, if you have immune system problems which lead to bronchiectasis, then you are likely at risk for other illnesses that could be life-threatening. In this scenario, a life insurance company will be more cautious when issuing your policy. Your life insurance policy is likely to have a higher premium than someone who has bronchiectasis as a result of childhood pneumonia. Will bronchiectasis cause early mortality? There is currently no cure for bronchiectasis, however, if you catch it early on and take measures to prevent further damage, then you can live a healthy, normal life with the condition and avoid being labeled high risk life insurance. If, however, you have severe damage to your airways, then it could lead to bigger problems such as respiratory or heart failure. If you have severe damage because of bronchiectasis, then your chances of securing traditional life insurance are much lower, and you may need to opt for a burial insurance policy from one of the best burial and final expense insurance companies. How much will my life insurance policy cost? The answer to that question really depends on the extent of the damage. The more severe your case, the more your premium will be. It’s really unlikely that you will get a standard rate with bronchiectasis, but you can possibly get a mild substandard rate if your bronchiectasis isn’t very bad and doesn’t impact your daily life. These things will all factor in when a life insurance company determines the rate they offer. It’s also important to realize that two different life insurance companies may offer two completely different rates after assessment. This is because some life insurance companies are more preferred for certain factors. It’s important to know that because of these variables it is impossible to recommend a one-size-fits-all insurance company for people with bronchiectasis. The life insurance company and policy that is good for one bronchiectasis patient may not be the one that’s good for you. How do I figure out which life insurance company to choose? There are dozens upon dozens of life insurance companies all claiming to have the best policies. If you are a normal person with limited exposure to the world of life insurance, it’s difficult to know which life insurance company best suits you. That’s where TermLife2Go can help. We work with people with unique cases—such as people with bronchiectasis—and help each one find the right life insurance policy. We do not favor any one life insurance company over the next; our aim is simply to get people the best coverage possible, and we know that each scenario is unique.TermLife2Go gets to know you, your needs and your budget and then uses that information to shortlist the best policies for you. You make the final choice. We can make solid recommendations because we have extensive knowledge about the different types of life insurance policies offered by dozens of the best life insurance companies in the United States. If you would like to know more about how TermLife2Go can help you get the life insurance coverage you deserve, then contact us today for a free consultation. Thank you for reading our article, Life Insurance with Bronchiectasis. Please leave any questions or comments below. Previous Post: Life Insurance after Kidney or Other Organ Transplants. Next Post: Finding Life Insurance with Peripheral Vascular Disease.